If you often wonder how so many people can survive without starving in the makeshift camps of asylum seekers in Greece, the answer is usually “volunteers”. Despite the very limited media coverage, a gigantic solidarity machine is wandering around across Europe. Some people reach Greece on their own and stop where there’s more need, solely relying on Facebook pages dedicated to organize volunteer work in Greece’s various regions, while others decide to structure their work in groups and focus on the provision of specific services. A good example of the latter is the German group “Soup and Socks”, created in November 2015 and ready for their third volunteer trip to Greece. Their story is startlingly simple and, therefore, fascinating: Manuel is a student in Heidelberg and in fall 2015, his mum asks him to join her to go volunteering in Greece, a country she has many ties with. Manuel accepts but while preparing for the journey his mum realizes that it will be impossible for her to leave Germany. So, Manuel talks about this opportunity with his friend Florian, whose brother, Tobias, is a chef and their father owns a catering service. Together they decide to build a bigger group of friends that could go to Greece and cook to provide food for as many refugees as possible. Over the span of a month, two vans full of food, cooking gear (borrowed from Florian’s father) and about ten people left Heidelberg heading towards Greece. You might of course also wonder how they could afford the food and the journey, and the answer might astonish you even more than the previous one. The first trip to Greece, which took place in December/January 2015-2016 and lasted about two weeks, was fully funded by acquaintances of the broader network of the Soup and Socks members, such as family, friends, ex-schoolmates, acquaintances, etc. “For our first trip, I think the whole funding scheme was just based on trust: people who knew us personally and who trusted us would just say: “sure, why not? I’ll support them” and so we reached 20,000 euros in less than a month. We would never have expected such a turnout”. 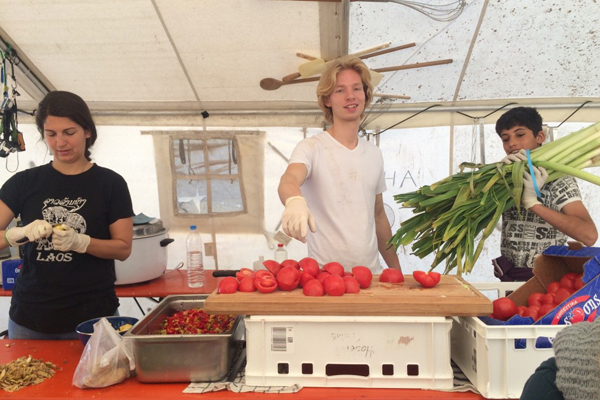 During their first trip, the Soup and Socks crew decided to stop off at a camping site on the outskirts of Athens (solely for cooking), then transported the food to the city center where they gave away 800 meals per day for two weeks at the squares Victoria and Omonia. As soon as they went back to Heidelberg, the Soup and Socks members started planning a new trip, which took place in April 2016. This time, they decided to stay in a camp in Katsika, in the North of Greece, where many asylum seekers wait hoping that the Western Balkan route will soon be reopened. To fund this second journey, Florian proposed the launch of a crowdfunding campaign that quickly brought the same successful results as the first trip. “The original group that left Heidelberg was composed of only 10 people, so we would never have made it without the fundamental help of many asylum seekers stranded there. In fact, despite a very short initial phase of disorientation, due to the complete novelty of the situation for us, we became quickly part of the daily routine. Although verbal communication was often impaired by the lack of a common language, we managed to “speak” with everyone about everything”, claims Manuel. Kat, another member of the Soup and Socks crew, confesses: “at the beginning I was a bit skeptical because I had never been to a camp before. but then you just realize that the people waiting here are people like you and me When asked about episodes of racism or widespread racism towards the migrants in Greece, Manuel and Kat shook their heads in denial. “During the month we were in Katsikas we never noted racism towards the migrants. The locals we met were ratherangry at the European Union [institutions] instead. From what we have seen, even the police were always friendly with us and with the other people living in the camps”. In August 2016, Soup and Socks will travel to Greece again, with the aim of establishing a so called FabLab or work space where people can build things, repair their property or even create products that will then be sold on www.habibi.works, a freshly released web store. The aim is to create solutions instead of waiting in vain for them. But for how long can the humanitarian aid still rely on volunteers?